Cable Solutions is proud to present the complete TechLogix Networx product line! These are early days, so the product index is still pretty rough, but we do have the complete line, so please do not hesitate to contact us for information or pricing! MantelMount • Innovative Articulating Pull-Down TV Mounts - Father's Day Sale and "Free" Shipping Promotion in progress! Mount your TV over your fireplace mantel, or any other place where you would like to be able to lower the TV while viewing. DarbeeVision DVP-5000S • HDMI Video Processor - Special Pricing! Canare 4S8 Star Quad - New Item! This slimmer 8mm Star Quad cables provide great performance in bi-amp, bi-wire, and conventional wiring configurations. They come with the same termination options as the larger 4S11 cables, but with a slimmer profile and even greater flexibility. Great for multi-cable bi-amp and bi-wire applications too. Switches in less than 0.5 second. Input and output, up-scaling and down-scaling, video processor technology joins a high-performances HDMI switch for maximum versatility and elegance! This ISO-MAX is specially designed for low-frequency applications. It offers common mode rejection of 105 dB at 60 Hz while also helping to eliminate RF interference...features extended low frequency down to 1 Hz and virtually non-existent distortion for hum-free subwoofer hookups. This value-priced system transmits HDMI up to 70 meters (230 feet) over a single twisted pair-cable such as Cat-6 or Cat-5. The system comes complete with transmitter and receiver units. HDMI v1.4 compliant. Intelix DIGI-P123 integrates functionality that would traditionally require multiple devices into a single sleek 1RU system. Scales, converts, combines and mixes video and audio from up to 12 sources and outputs in the format and resolutions of your choice via HDBaseT, HDMI, DVI, VGA and a built-in audio PA system. Also available without HDBaseT as DIGI-P122. Jensen Transformers' SC-2NR Stereo Speaker to Line Audio Converter is audiophile-grade device that provides an elegant way to convert speaker-level audio to line-level audio. New for 2013, the Jensen Transformers CI-RJ2R-T / CI-RJ2R-R Stereo CAT-5 Audio Balun Set provides an elegant way to extend audiophile-quality analog stereo audio signals up to 350 using twisted-pair cabling such as Cat-5 or Cat-6. Use as a stand-alone HDMI matrix switcher, and/or add optional HDBaseT twisted-pair receivers to connect remote zones, creating a sophisticated HDMI matrix distribution system. With eight inputs, eight local HDMI outputs, plus another eight twisted-pair outputs, the DIGI-88B can be used as a stand -alone HDMI matrix switcher, or add optional HDBaseT twisted-pair receivers to connect remote zones, creating a sophisticated HDMI matrix distribution system. This new matrix system is so unique that we don't even have a proper category for it yet! Yes, it can distribute HDMI via twisted-pair, but it can also handle DVI, VGA, Y/Pb/Pr component video, and/or HDBaseT and audio signals as well. And it has local output options as well! A larger version of the model above, this 16 x 16 matrix system can distribute HDMI via twisted-pair using the HDBaseT protocol, but it can also convert, scale and switch DVI, VGA, Y/Pb/Pr component video, and/or HDBaseT and audio signals as well. Both local and remote zone outputs are supported! With the capacity to handle up to 32 inputs and 32 outputs, this is the largest member of Intelix's Flex Matrix family. It can distribute HDMI via twisted-pair using the HDBaseT protocol, but it can also convert, scale and switch DVI, VGA, Y/Pb/Pr component video, and/or HDBaseT and audio signals as well. As with the smaller system, both local and remote zone outputs are supported! Receives HDMI, IR and RS-232 up to 60 meters (195 feet) over a single twisted pair cable such as Cat 6 or Cat 5 using the HDBaseT protocol. HDMI v1.4 compliant. Intelix SKYPLAY-DFS Wireless HDMI Extender System - New! SKYPLAY-DFS seamlessly distributes HDMI high-definition audio/video up to 100 feet in both point-to-point, point-to-many, and many-to-many configurations! One-Day Shipping for Any Configuration! With ten different input and output card options, the HLX Series is a truly versatile platform To make it even better, we stock all of the chassis and expansion cards, so we can build and ship just about any configuration within one business day! Check out our pre-configured systems and individual components, or build your own using our HLX Configurator. Audio Authority Audio Matrix Switcher • 8x8 Audio Matrix Switcher - iOS and Android Control Apps Now Available, In Stock! ADX-0808 is an ultra-controllable 16 x 16 Audio Matrix switcher that seamlessly integrates with third-party control systems, such as Control4, URC, RTI and more. Designed and built in the USA. Audio Authority SonaFlex SF-16M • 16-channel Digital Matrix Zone Amplifier (60 WPC) - iOS and Android Control Apps Now Available, In Stock! 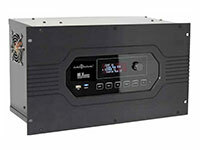 Powerful, musical, sophisticated, and installer-friendly, Audio Authority's SonaFlex Series amplifiers bring a new level to distributed audio. Now with control apps for mobile devices. Android and iOS control apps now available! Designed and built in the USA. The Intelix DIGI-HD-4X4 combines a professional-grade HDMI matrix with Intelix's industry-leading extenders. Each system provides four HDMI inputs, four HDMI outputs, and four twisted pair outputs. Great products for home theater, stereo, video, A/V systems, digital signage, and computer integration. We work hard to give you fast, intelligent responses to your questions and concerns, as well as rapid shipment of your orders! HDMI, Video, and Audio Distribution Distribution Systems, Switchers, Extenders, Cables and More! At Cable Solutions, our focus is upon high-quality products for home theater, stereo, video, A/V systems, digital signage and computer integration. We have the expertise to help you decide which products are right for you, and when you’re ready to order, we’ll ship out your products as soon as humanly possible. Cable Solutions has the products you need to distribute video and audio throughout multiple rooms of your home or business. We provide top quality audio distribution systems, video distribution systems and matrix switchers for multi room systems. Use our built-in control systems and mobile apps, or use with a third-party home automation controller. We’re proud to provide video enhancement processors from DarbeeVision - the only company that brings you the highly-regarded Darbee Visual Presence technology, revealing hidden details and clarity in a way that no other enhancement technology can. You will find a level of product knowledge and expertise at Cable Solutions that few others can match. We are a stocking distributor. Combine that with our intense focus upon fast shipping, and that means that we really can get your order out to you faster than our competition. The products featured on our site represent the latest and greatest technology from the manufacturers that we represent, and the manufactures themselves are chosen because they offer unique products, features, and value. If a manufacturer does not measure up to our high standards, you will not find their products represented here. We keep up with technology changes so that we can provide you with the best overall experience possible. If you want the best, look no further. If you have questions, please do not hesitate to give us a call or send us an email today for fast, friendly and knowledgeable customer service.